So-Cal Builders is sponsoring team CP / SSP! So-Cal Builders is a proud sponsor of the team CP / Sewer Septic Pros, a local men's softball team that just won the ASA Western "D" Nationals tournament this past weekend. These guys are from all over the Coachella Valley, so let's show them some love by helping to send them to Oklahoma City, OK for the National Championships held at the ASA Hall of Fame Stadium. Not only will they be representing the entire Coachella Valley, they will also be representing the entire Western United States. WOW! It's Transformation Tuesday again, and we love this patio transformation! We built a custom barbecue with ample seating and counter space, and we also built a custom raised planter with a large fire pit, perfect for relaxing and entertaining guests outdoors. Sit back, relax, and enjoy this beautiful sight! See our latest client review! The greatest compliment is a referral! To read our latest customer reviews and more, please be sure to check out our Yelp page and see why So-Cal Builders is committed to quality workmanship and customer satisfaction. View So-Cal Builder's business page on Yelp. It's Transformation Tuesday and we are pleased to share this home exterior transformation with you! We turned an ordinary residence into a beautiful home with added curb appeal. Looking to upgrade your home exterior? Let us know, we'd be happy to help! The living room is the heart of every home, a place where friends and family can gather to relax, entertain, and make memories. Wouldn't you like to make your memories in a space like this? 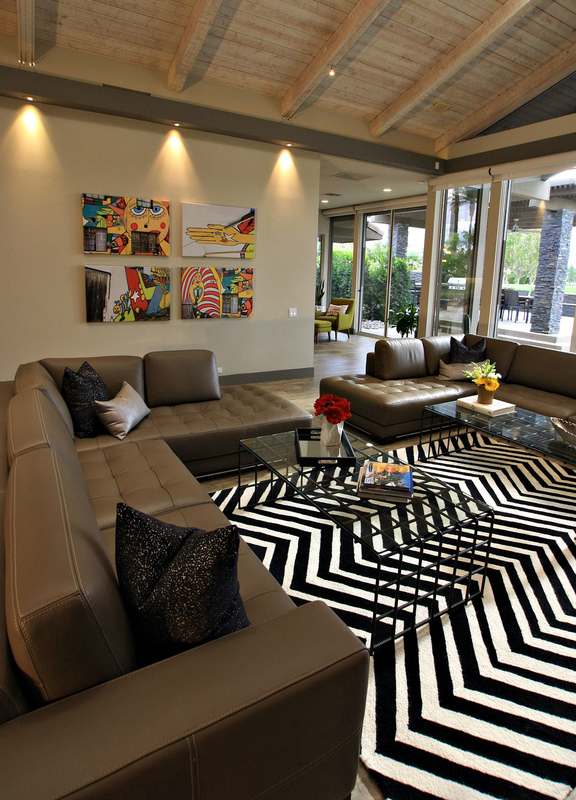 Let So-Cal Builders transform your living room from ordinary to extraordinary. Looking to enhance your curb appeal? We can help! Check out these before and after photos of a recent renovation project where we transformed the exterior of this Rancho Mirage home into a true work of art. Palm Desert, CA, January 12, 2016 – So-Cal Builders of Palm Desert, CA has won “Best Of Customer Service” on Houzz®, the leading platform for home remodeling and design. The 20 year old custom residential remodeling and building company was chosen by the more than 35 million monthly unique users that comprise the Houzz community from among more than one million active home building, remodeling and design industry professionals. So-Cal Builders was established in 1995 as a custom residential remodeling and building company, providing the highest quality construction services on a referral only basis. Residential projects include complete home renovations, room additions, kitchen and bathroom remodels, custom home building, pools, and outdoor living areas. So-Cal Builders has been building spec homes along with renovating and reselling numerous homes for many years. Michael Roberts, president of the company, is a licensed and fully insured general building contractor with over twenty five years of remodeling and building experience. Michael is a native of southern California and a resident of the Coachella Valley for over twenty five years.For more information, visit so-calbuilders.com. A beautiful transformation where we turned an ordinary kitchen into an extraordinary space! We teamed up with An Interior Motive Designs to make this client's mid-century modern kitchen dream design a reality. For more photos of this project, please visit our Home Renovations page. Just another day in the field! Check out this custom home addition in beautiful Rancho Mirage, CA.